So I am jumping on the bandwagon. 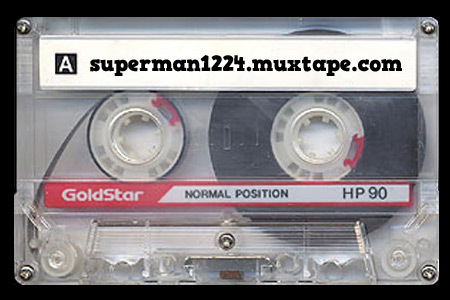 Here is my very random muxtape. Here are a few others in my circle of blog friends. Yes, yesterday was Easter, but I am still feeling it today. There was A LOT of hard work done by so many people yesterday and I feel as though it paid off! I am so thankful that I can be a part of a body that has been blessed with such talented God Loving people. Yesterday’s set was probably one of those sets that will stand out for a long time. I am hoping to have some video up this afternoon or tomorrow. It was really awesome to be a part of it. Here is our set. I really hope we don’t wait a year to do these songs again. I think Creed is one of my favorite songs to play. Mighty to Save is up there to. That song sticks with you all day. Hope your guy’s Easter was as great as mine. This was in the project brief I got this morning. This is for a consumer brochure for a line of our beans. From the chatter I hear, this is going to be one of two episodes that you CAN NOT MISS. After tonight everything will change. Smallville is finally back on. Hero marks the return of Pete Ross. Also don’t miss One Republic and the shameless promotion of Stride gum. Poor Pete, he always has to be the guy to hock something, even when he is the guest star. BILLBOARD CHART-TOPPING BAND “ONE REPUBLIC” PERFORMS AND PETE RETURNS — Kara (Laura Vandervoort) and Jimmy (Aaron Ashmore) attend a “One Republic” concert and one of the roadies turns out to be former Smallville resident Pete Ross (guest star Sam Jones III). Pete unwittingly chews some kryptonite-laced gum and develops super powers. Clark (Tom Welling) and Chloe (Allison Mack) are thrilled to meet up with their old friend but warn him against using his powers in public. However, Lex (Michael Rosenbaum) discovers Pete’s powers and blackmails him into helping break into a Lionel’s (John Glover) safe by threatening to reveal Chloe is a meteor freak. Kristin Kreuk and John Glover also star. Michael Rohl directed the episode written by Aaron Helbing & Todd Helbing. Probably not going to be the best episode to date, but it will be cool to see Pete. Here is a look at the Smallville schedule for the rest of the season. May 1 Episode #7-18 NEW! May 8 Episode #7-19 NEW! May 15 Episode #7-20 NEW! One of the greatest things about my job other than the fact that I get to create all day, is I can listen to music. Not many people can say that about their job. I come in, grab my coffee, put on the headphones and jam all day long. Of course there are a few drawbacks to wearing headphones , but believe me, the positives far out weigh the negatives. It’s safe to say that headphones have saved the lives of many of my co-workers more than once. It also has been a safe keeper to my sanity. If I ever had to get another job, I think I would take a pay cut if it meant I could still wear headphones while I design.